Arlington Pond is a beautiful recreation site located in Salem, NH. The water is of high quality and supplies a portion of the Salem’s water. The 269 acre pond is accessible only to the residence living on the water as there are no public boat launches. With such an exclusive site for recreation, it’s important for the residents to have the best Arlington Pond Docks and Lifts without the expensive price tag. Metal Craft Docks have been the preferred choice for property owners on Arlington Pond for over 20 years. Stationary or fixed piers perform well on this body of water due to the low fluctuation in water level at summer pool. When the pond is lowered in the fall, removal of the docks system is quick and easy. Metal Craft Docks feature all aluminum construction with a superior non-skid, baked poly acrylic finish ensuring boaters safety as they enter and exit watercraft. Build the dock of your dreams with four standard deck widths, three standard lengths, and three color choices. Additional accessories include swim ladders, a bench, dock lights, mooring cleats and bumpers to name a few. 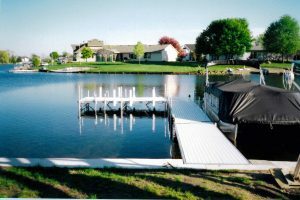 Contact PRB Waterfront Services for assistance with your dock configuration. Metal Craft offers aluminum boat and PWC lifts. Our vertical boat lifts accommodate watercraft up to 6,000 lbs. Metal Craft aluminum boat lifts feature a deep “V” design allowing entry to the lift in shallow water or deep water. Our side-trussed design provides extra strength for superior protection for watercraft. Standard features include stainless steel cables, nylatron pulleys, and stainless steel fasteners. Additional accessories such as electric boat lift motors make operating your lift as easy as turning on your car. Deluxe bunks and guides and pontoon kits make docking easily even for the newest of skippers. Canopy covers offer additional protection for your watercraft and are available in many different styles and even more colors for that personalized touch. Personal Watercraft Lifts or PWC’s are available in two models and will hold watercraft up to 1200 lbs. Our cantilever design allows for easy docking in the shallowest of water. A three-pulley system and galvanized aircraft grade cable require minimal maintenance. Metal Craft PWC lifts feature the Dutton-Lainson winch for smooth lifting and the Lorenz 26″ wheel makes for a smoother operation. Optional accessories include a winch post extension kit and Lift Tech Marine DC-100 battery power motor. Contact Len Newell for assistance selecting the correct boat lift or jet-ski lift for your needs. Metal Craft Docks is a family owned and operated business priding ourselves on exceptional quality, design and outstanding customer service. We have been manufacturing docks for over 80 years! Metal Craft Docks and Lifts are made entirely of aluminum so they are naturally light-weight making installation and removal for storage easier. We are proud of the craftsmanship that goes into every one of our products manufactured locally in our Mentor, Ohio facility. When you purchase a Metal Craft Dock and Lift you are making an investment. We know you will be happy with your Metal Craft purchase for decades to come! PRB Waterfront Servicesis owned and operated by Len Newell out of Merrimack, NH. 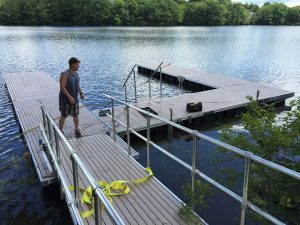 Most residents of Arlington Pond purchased their original docks from Merrimack Handling which was purchased by Mr. Newell over 15 years ago. Today, PRB Waterfront Services operates a full service company covering all of the New England states providing consultations, worry-free Metal Craft products, installations and maintenance of our aluminum docks and lifts. Please contact Len at (603) 321-1117 or email len@thefurniturehotel.com with questions or to receive a free estimate. Visit his facebook page for additional pictures of his completed projects.